These are the artists you will meet when shopping in the store. Being an Artist Co-op, we run the store in addition to making the items we sell. I am a registered nurse by profession and I have belonged to Womancraft since 1982. Sewing and crafts have provided me with a creative outlet since childhood, when a neighbor taught me to sew doll clothes by hand. Over the years I have tried a variety of fiber arts and crafts: cross stitch, knitting, needlepoint, crewel… finally I settled on placemats, potholders, baby quilts, pincushions, fabric folios and hanging towels. I use 100% cottons and blends, make my own templates, choose my own color combinations and use traditional and contemporary ideas from books and magazines. I make crocheted items, beaded jewelry, and photo notecards. Sometimes I use recycled materials, such as beads made from paper, in my making process. I enjoy crocheting scarves, afghans, and market bags. On my jewelry I note the composition of earwires, beads, and findings, and the weights of my earrings. I became interested in the beauty of mushrooms while walking the Al Buehler Trail at Duke, and now I photograph them for unique notecards. I am a self-taught, mixed media artist who works out of my studio at The Clay Centre in downtown Carrboro. I have more ideas than time, and am always adding new items to my collection at WomanCraft. My work includes mosaics, Indian glass bangle art, pendants, themed charm bracelets, picture frames, mosaic keepsake boxes, mirrors, handstamped word and quotation jewelry, and a series of Tarheel and Chapel Hill-themed items. I started making jewelry just for the fun of it and have learned by trial and error. My past in geology influences my choices of beads: agates, amethyst, jaspers, lapis, etc. My designs try to bring out the colors and unique patterns of the rocks and often include chains and wire wrapping. It’s a great thrill that others enjoy wearing these creations. I am happy to take special requests. In addition to my jewelry I have added hanging crystals, eye glass chains and mobiles. I have been knitting since the age of 7; my mother taught me in order to keep me occupied but still. I started designing early on to keep my dolls in the latest knitted fashion accessories. I have taught knitting and spinning for over 20 years and am a proud member of the North Carolina Village of Yesteryear. I spin the wool from my own small flock of black sheep. The joy of creating distinctive items is my primary drive, inspired bytrying new colors, textures, and techniques. Because I create without using a pattern or keeping notes, exact duplication of any item is unlikely, each unique and handmade by me. I am a retired scientist who now makes pottery in my studio at the Clay Centre in downtown Carrboro. I also sew whimsical aprons and other clothes which can be found at Womancraft. Sewing has been a hobby of mine, and a source of much of my personal wardrobe, since I was a child. I learned the basics in creating clothes for my dolls and moved from there to making my own clothes. From the sewing machine I moved to a variety of other needlework, including knitting, cross-stitch, needlepoint, crewel embroidery (which I taught for several years when our children were small), and now quilting. After retiring from a career in campus ministry, I have returned to the sewing machine. My first product at Womancraft was flaxseed and lavender “pillows” or wraps which, heated or cooled, can bring comfort and even relief to sore or tight easily be mailed – no breakage! Since joining Womancraft I have also begun to sew standard-size pillow cases in children’s prints. Picking up on my recent interest in quilting and the fabric selection involved, I love browsing the fabric stores, searching for just the right 3 pieces of complementary fabric to make each pillowcase — the perfect “grandmother” gift. Two of the many things my mother taught me as a child were a love of history and the joy of creating something with my hands. From that I have developed my skills as a weaver and a quilter. I have studied weaving at Penland School in NC, and have taken quilting classes locally, as well as in France, the UK, and Hawaii. Although I may never use all the fabric and yarn that takes up a good part of my home, I have learned to say I collect yarn and fabric, thereby alleviating the guilt, and allowing me the pleasure of always adding to my stash. I hope you receive as much pleasure in owning a piece of my work as I did in crafting it. I am a native Virginian and recent transplant to beautiful North Carolina, who has enjoyed painting for more than 20 years. I am primarily self taught, with a special interest in "stroke work", a form of tole painting. My pieces are primarily done on glass, and patterns are inspired by traditional lace or crochet patterns, historical decorative borders, etc. and are created by combining individual stokes - one at a time. All items are air dried and then heat set in the oven, so they are dishwasher safe (although hand washing is recommended). When not painting, you might see me in the local thrift shops or clearance isles in local stores looking for my next project. I have added cross-stitch hangings of birth month flowers. I have always loved crafts and quilting. However, it wasn’t until I had chemotherapy that I became truly creative. Su-Di Designs was started in January 1993 thru a fluke. My friend made a mistake making her wall hanging and had to rip the center 4 squares out. She then decided to use these squares to make individual miniature quilt pins. I saw this and immediately knew this was a good idea. Thus we started making the pins for our friends and Su-Di Designs was launched. Over the years I have expanded my products to include reversible vests and jackets, purses, totes, decorated sweatshirts, coiled baskets etc. I specialize in making wearable art that anyone would love and can afford. I am the daughter of an artist and have sent my life dabbling in various forms of art to satisfy the urge to create. I have always loved paper, hoarded notebooks as a child and cut my teeth on origami and scrapbooking, but when I learned to make true 3 dimensional objects from paper I found my true passion. I love taking such a fragile and everyday materiel and making it do things it does not normally do. Instead of glass houses I choose to make paper ones. I build a variety of complex structures, mixing and matching colors and patterns of paper, adding texture with embossing, further dimension with inking, and sparkle and light through embellishments and LEDs. My work is whimsical, and yet often strives to be useful, a box for a gift or a soft night light for a child’s room or a powder room. I often hear “I’ve never seen anything like that!” - what fun to make people see a small thing like some paper and glue in an entirely new way. From graduation hat cards to pink dinosaurs I love to try my hand at new things so if you’d like to see something different please let me know. In 1983, I learned to make Seminole patchwork. This machine quilting technique was created by women from the Seminole Indian tribe in Florida during the 1800s. I now include my patchwork in over 30 different gift items including book covers, bottle totes, aprons, potholders, coin purses, eyeglass cases, notepads, towels, etc. My patchwork also decorates children’s sundresses and rompers. In addition to patchwork, I make North Carolina longleaf pine needle baskets using a coiling technique. The baskets incorporate bottoms made of Seminole patchwork, antique quilt pieces made by my grandmother, and stoneware disks made by my sister. I also work with other Womancraft artists to round out my collection. My husband, Neil, and I work together to create heavily textured abstract paintings. Inspired by the work of American and European printmakers, we create acrylic pieces that contain embossed and textured effects typically associated with etchings and other prints. After an initial background painting, we apply modeling paste to the canvas and immediately mark it with various tools to produce three dimensional effects. Our gallery wrapped pieces have heavy texture on all four sides as wells as on their faces, creating interesting surfaces all around. Because of their detailed markings, our paintings are meant to invoke natural phenomena such as underwater scienes, aerial maps, fossils and rocky mountains. Contact us at 919-360-7207 or capalomba@hotmail.com. Visit our website atwww.CNPartists.com. Mary (Dusty) Penta, owner of MARY’S METALS, is a certified Precious Metal Clay artisan who has studied silver smithing and mixed media arts with nationally recognized instructors. She and her husband have lived in Chapel Hill for 40 years. Since retiring from a career as a teacher and educational evaluator, Mary has been able to focus on her love for creating wearable art jewelry from silver, bronze, and polymer clay. WomanCraft provides an ideal venue to display and share her work. Why LateBloomerPottery? Because I came to this passion relatively late in life, after spending many years as a special educator and therapist. Now, I enjoy making beautiful, functional stoneware pottery. I love working on the wheel, making and altering forms, decorating with slip, carving, and playing with color. I use mid-range clays, food-safe glazes, and generally fire in an electric kiln. All of my pieces are microwaveable, safe for the oven, and dishwasher safe. I am so happy to offer unique pieces to be held, viewed, and most of all, used. I hope you find something that touches your heart and senses! I took my first pottery class when I was twelve and have been somehow involved with clay and glass ever since. Whether it was that pottery class in college, my internship with a Korean potter when I was in the Peace Corps, or collecting Fiestaware when I lived in L.A., I've always been fascinated by the way dirt and silica mixed with some hard work and inspiration can become something beautiful and useful. My pieces are meant to be used, so I strive to make them comfortable to hold, convenient to use and, of course, pleasing to look at. I hope that you will find something here that you will want to use every day - because art should be an integral part of our everyday lives. I have been selling quilts and repairing them since I joined Womancraft in 1978. I have also, at times, done knitting and knitting repairs. For me, quilting has always been more of a therapy than an occupation. My quilts usually follow traditional patterns, and I always hand quilt them. 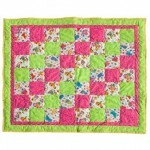 I have also repaired many quilts, some of them quite old and very dear to their owners. I have always been interested in fibers and have done knitting, crocheting and sewing most of my life. I made my first basket 19 years ago. I weave with reed, ash, cedar, paper and metal. The end products may be utilitarian (a market basket), decorative disguised as utilitarian (a paper basket) or purely decorative. I have resisted specializing in only one field of basketry since I enjoy exploring different materials, techniques and the play between utility and decorative. I am a metal smith focused on jewelry handcrafted in silver, copper, titanium, niobium, and enameled fine silver and copper. I studied metals and enameling at Penland School of Crafts, as well as in Seattle, and various workshops in Charlotte, Raleigh, and Carrboro. I share my life and a home studio with my artist husband Jack Swinney of the Chapel Hill Wood Turners. I am a printmaker who specializes in both woodcut and linocut printmaking on cards and Japanese paper, with an emphasis on often hand-painted natural subject matter. I studied printmaking at Guilford College in Greensboro, North Carolina and produce all of my work at my home studio in Carrboro, North Carolina. Grace has added sandstone coasters and trivets to her line. For thirty years I worked in the corporate world and spent my spare time developing skills in a number of crafts: sewing, knitting/crocheting, quilting, painting, pottery, etc., etc… However, it wasn’t until I was introduced to stained glass that I knew I had found a craft I could call my own. Glass fascinates me! I love the variety of textures, the richness of colors, the fragility and endurance of the product, and most amazingly – my surprise and delight of its interaction with light! I finally started doing commission jobs and selling my creations at weekend shows, consignment stores (such as Womancraft since 2003), and even running my own craft gift stores. I like to believe that my stained glass work is similar to what I’ve experienced in life. By adding a little light to a subject, all the various textures, colors, and myriad combinations of glass can surprise and charm you with their unique potential. I am a fiber artist specializing in sewing, quilting, embroidering, crocheting, weaving, and hand spinning yarn. My parents and grandparents instilled thecreativity and thrift, while my children and grandchildren inspired thewhimsy and quirkiness in my designs and products. I love to repurpose objects into the unexpected, drawing the eye, and starting a conversation. You can find my purses, pincushions, wall hangings created from men’s neckties, tooth fairy pillows, skirts and purses made from up-cycled blue jeans, and my crocheted items, wine totes and hand spun yarn at Woman Craft Gifts. This life we have is a gift. It is a wonder to me that it comes in so many shapes, sizes and forms. My drawing and painting have long been motivated by the need to respond to the beauty I see around me. The amazing grace of trees and plants, the fluidity of animals, the outrageous colors of the earth, all provoke me to paint and draw. I rarely have a plan. I paint, draw, layer, dance the line around the canvas or page, then wait for who or what shows up. As an adult, I loved the feel of the earth in my hands, as well as seeing beautiful plants spring to life in the garden. I was fascinated by potters working at the wheel. These threads drew me to clay. After clearing the hurdle of being my first teacher’s “challenge student”, I gradually assimilated the techniques of many wonderful teachers at Duke Craft Center, Claymakers, NC State Craft Center, John C. Campbell Folk School, and the Odyssey Center. I now concentrate in four main areas. Hand-built animal forms turn into whistles, piggy banks, and raku sculptures. I carve flowers and dragonflies on slip-covered bowls. Garden totems and goddess sculptures are my most recent creations. I make necklaces, earrings, and bracelets using semi-precious stones, freshwater pearls, crystals, Thai silver, sterling silver, pewter and copper beads. Many of my necklaces have a pendant of Thai silver, in the form of a flower, a leaf, an insect, or an abstract design. These pieces are made by hand by the Karen Hill Tribes in northern Thailand, using traditional methods. Their silver has a higher silver content than sterling, making it softer and easier to shape. Lately, I have added necklaces focused on glass centerpieces and beads. After retiring and moving to North Carolina, I discovered the John Campbell Folk Art School and fell in love with gourds. The sizes and varieties were inspirations to creating and I could add my life long collection of beads, naturals, yarns. and reeds from a previous weaving time. For over a dozen years, I have enjoyed cutting, carving, painting and dreaming up designs. My wish is to give others a smile with the end results so that they can enjoy one of nature’s gifts....the simple gourd. My pottery journey began in Maine in the 70s, where I was a full-time production potter with studio, shop, and pottery apprentice training program. Recently returning to my pottery passion, I have again immersed myself in the clay. I find deep satisfaction in watching the raw clay magically take form. Then using altered form, carved line, and surface design, sheI integrate design with the functionality. I am known for my wheel-thrown and hand-built functional stoneware pottery with soft contemporary colors. Perfect for everyday use and as an heirloom to pass through the generations. I’m a self-taught polymer clay and bead artist. For as long, as I can remember, my eye has gravitated towards colorful shapes and textures found in nature. As an only child, I found my delight in designing at an early age. From crayons, pencils, play- dough to fabric and ultimately painting murals in high school. When I first picked up polymer clay, it was like meeting a long-lost friend. It speaks to me! What do you want to become today? I enjoy every aspect of it! When I’m not in the mood for making canes, which is very technical, I can go back to whimsical sculpting. Sometimes blending colors will result in a totally different outcome, taking me down a new road. As in life, it’s a journey! I live in Durham, North Carolina, where I opened a pottery studio in 1993. My pottery education began in the mountains of western North Carolina, and has continued at various workshops, including a summer workshop in Tokoname, Japan. I have taught pottery classes and workshops at the Crafts Center at North Carolina State University, at the Durham Arts Council, and at Claymakers, also in Durham. My work is both wheel thrown and hand built, made from stoneware clay, and intended for everyday use. I admire the beauty that can be found in simple utilitarian pots. I like pottery that is casual, but strong in line and proportion. These are the guiding principles of my work. Colored glass has always had a magical appeal to me by how the light can transform a piece in the intensity that shines through it, day or night. I was introduced to fused glass 8 years ago while teaching middle school art. The techniques used in the fused glass process allow me endless possibilities to create with color and light. I can cut, then shape and form the glass at high temperatures in the kiln. My original pieces can be appreciated visually, and practically, too. For example, my night lights, which allow the magical colored glass creation to shine through day or night. Fusing glass is my way of taking a break from the everyday work world where I teach clarinet and saxophone. My pieces are composed of cut, crushed (also known as frit) and powdered glass which, when fused in a kiln, create a solid piece. By heating the kiln to varying temperatures and using different firing times I can created a myriad of effects. When you put a piece in a kiln you have an idea of what will be created, however, upon opening the kiln after firing my first thought is that glass is truly alive and has an ebb and flow of its own. Glass is very tactile. I hope my pieces make you want to look, feel and wonder how they are made.